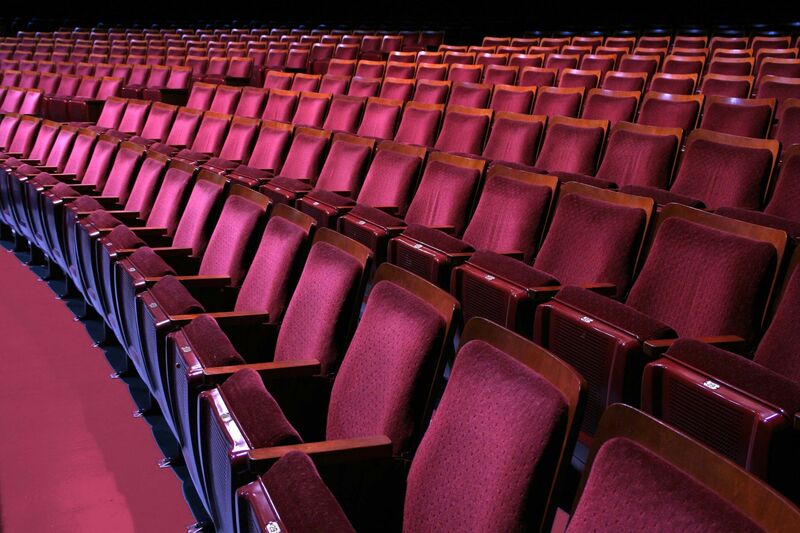 We naturally give heavy emphasis to the benefits of attending when we market the arts. We promote the excellence and uniqueness of our offerings. After all, even if two theater companies in the same market, for example, both produce contemporary plays, at any given moment in time they will offer different plays with distinct casts, directorial approaches, and design elements. This is our truth. Given this uniqueness, we would like to believe that people will come from far and near to see what they can only see by coming to witness our work. 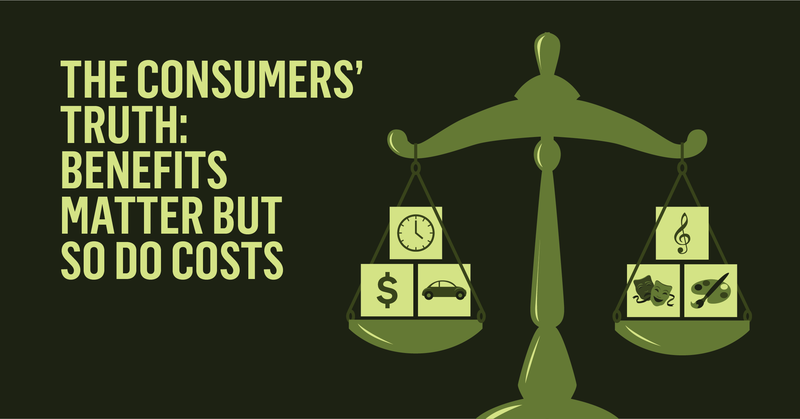 Yet perceived and real benefits are only half of the value equation from the customer’s standpoint. Their truth includes not only benefits, but also costs. Even if perceived benefits are sufficient to entice someone to consider attending, that person will weigh the attractiveness of those benefits against the monetary price of admission and non-monetary costs such as alternative use of time, not knowing where to go, the hassle of parking, etc. Influencing the decision of whether or not to attend requires concentration on both elements of the customer’s calculus: increasing real and perceived benefits and decreasing real and perceived costs. Arguably, there are few elements of organizational success that are more important but less appreciated than location. Location with respect to customers determines market potential, or the number and relative size of households in an organization’s trade area. Since live participation is a basic characteristic of most arts and cultural offerings, it makes sense to consider how far people will travel to attend. All else being equal, the cost of attending naturally increases as a household’s distance from the organization increases, so that a household’s likelihood of attending decreases. The onerous nature of travel time is exacerbated in markets with low walkability, where efficient public transportation is not a viable option, and commute times are high. But what distances are relevant? And which other factors in the marketplace affect patronage, and how? While consumer behavior research often captures the attitudes and perceptions of individuals through surveys, interviews or focus groups, there is something to be learned by simply observing human behavior. Through their behavioral patterns, people divulge a lot of information about their interests and the things that stand in the way of connecting with those interests. To explore the extent to which distance is relevant in the decision to attend the arts, we examined box office data in five markets, obtained through partnership with TRG Arts, for a total of 90 visual arts, performing arts, and community-based organizations. These organizations collectively served 2.4 million unique households. The average number of transactions for these organizations was 21,900 per year, which equates to roughly one ticket per household in their box office data per year. We pinpointed the location of each household and assigned it to its census tract to infer information about commute times, income, and educational attainment, calculated distances between each census tract and each organization, and kept all households in census tracts located within about 43 miles of the nearest organization. Our research reveals that the arts are radically local. 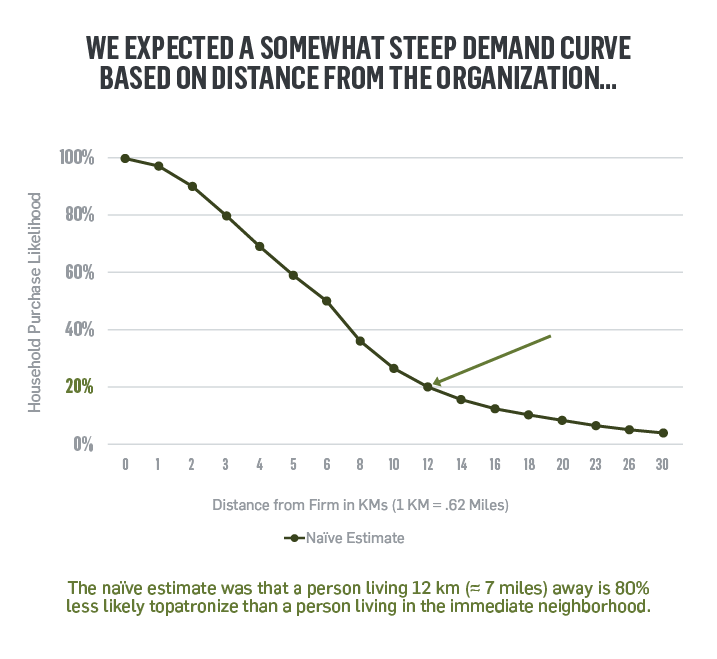 We expected distance to play a role as a cost in the value calculus, but we underestimated just how much location weighs in the decision to act or not to act. Based on an exploration of related research in retail settings, we initially estimated that a person living roughly 7 miles from an arts and cultural organization would be 80% less likely to attend than a person living in the organization’s immediate neighborhood (Figure 1). 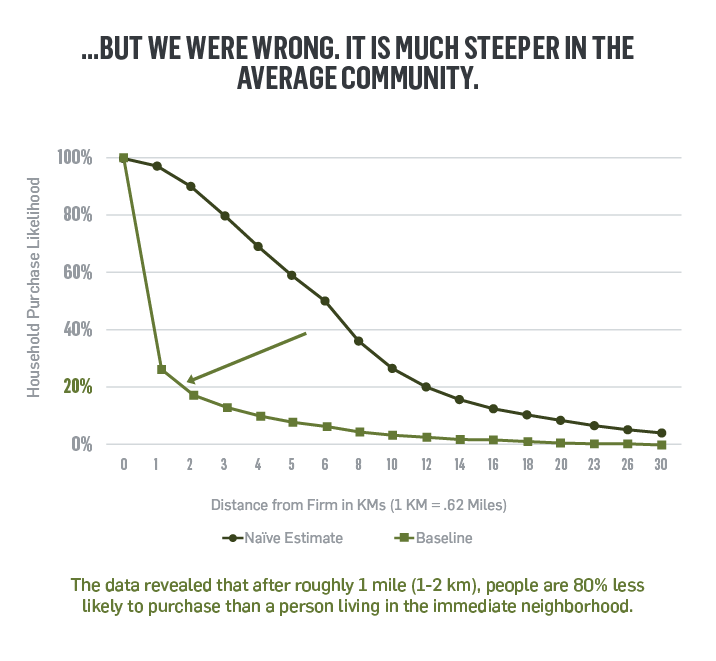 Analysis of the data revealed that, in the average community, a more accurate estimate is that patronage likelihood drops off by 80% at around 1 mile from the organization – not 7 miles (see the Baseline curve in Figure 2). The curve is different for each city and the differences can be explained by the effect that marketplace characteristics have on purchase likelihood. These characteristics include average commute time, socioeconomic characteristics, the clustering of other leisure activities in proximity to arts organizations, the concentration versus dispersion of arts and culture activity in the market, and availability of competing arts offerings located closer to where people live. To find out how each influences patronage, and where opportunities for marketers lie, see At What Cost: How Distance Influences Arts Attendance. Understanding the factors at play in a patron’s calculus of whether to engage or not to engage with your organization is at the very heart of understanding what drives behavior. Are you missing opportunities to better satisfy the needs of those whom you seek to serve, and to remove both real and perceived barriers to attendance? Dr. Zannie Voss is the Director of the National Center for Arts Research. She will be speaking at this year’s Digital Marketing Boot Camp for the Arts on Overcoming Digital Device Separation Anxiety.